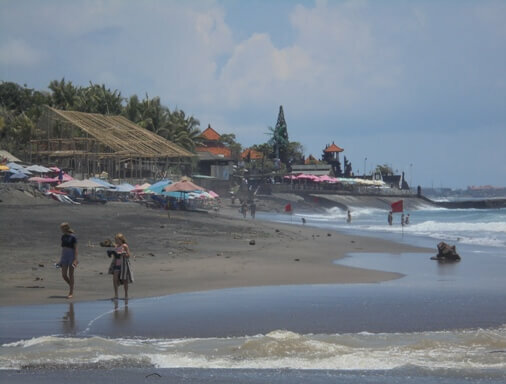 Batu Mejan Beach also known as Echo Beach is a grayish-black sand arc with great seascapes, delicious seafood cafes, and also one of the best surf breaks in Bali. 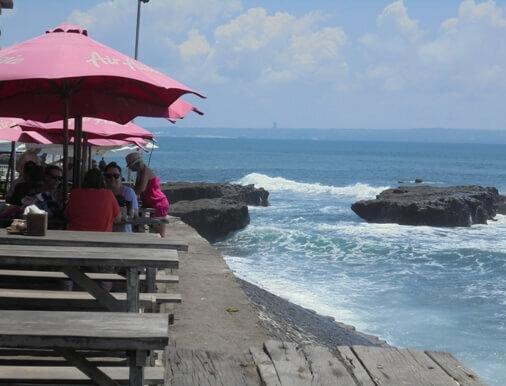 You can enjoy breathtaking views of the Indian Ocean, Pererenan Statue (Gajah Mina), Kuta, Jimbaran, and GWK. The beach is also endowed with magnificent sunset. The beach is situated in a coastal village environment with a slower rhythm of life, peaceful environment, fresh air and fertile rice fields. 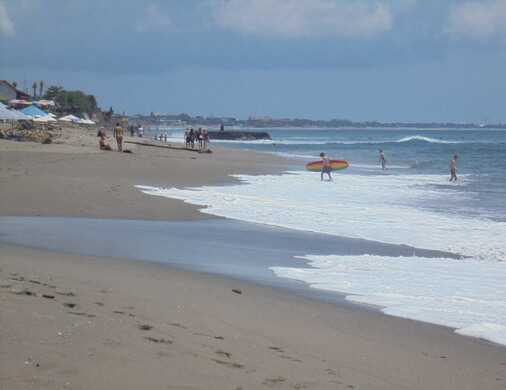 It is located in Canggu Village, North Kuta District, Badung Regency, Bali. 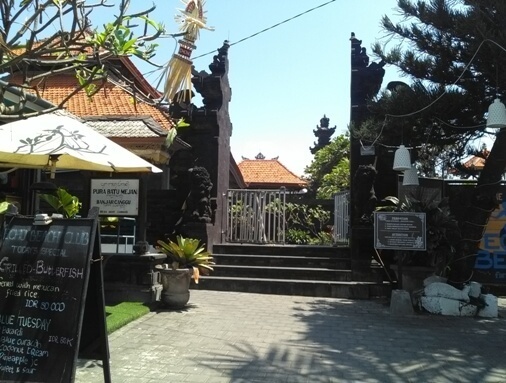 This spot is less than an hour from Ngurah Rai International Airport. You can reach it through the Jl. Sunset Road then continues on the Jl. Raya Kerobokan. Follow this road until you hit the Jl. Raya Canggu then continue on the Jl. Pantai Batu Mejan and you have found it. A significant Balinese sea temple, the Pura Batu Mejan Canggu, greet visitors with a magical feel. This is a centuries-old sacred temple, located on the seafront with a beautiful ocean view. The existence of this temple is related to the journey of a holy priest, Dang Hyang Nirartha. Balinese came during piodalan anniversary to pray for salvation. There are some prohibitions, so visitors are not allowed to enter such as: the visitor who is grieving due to the death of relatives and woman during their period. Visitors are also required to wear a cloth or a kamben. This is one of the surfers' favorite spots. The beach provides big and powerful waves, and is recommended for advance or professional surfers. 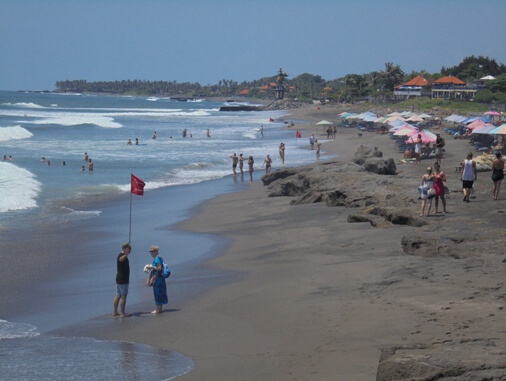 This is just a few walk to other surf spots such as: Pererenan, Old Mans Beach, Batu Bolong, and Berawa Beach. This is a fun weekend getaway, nice place to relax, and has great view for a leisurely walk in the morning or evening. Many villas, guesthouses, and souvenir shops are available near the beach. The dining spots lined along the paved courtyard on the beach edge, left and right side of the temple gate. Visitors can enjoy activities such as sunbathing, soaking, or enjoying the laid-back feel and delicious food. A few descent steps will tempt you to explore the low-lying grayish-black sand along the coast. You may encounter many local dogs. You can rent a lounger, parasol, or bean bag, while enjoying the sound of the waves and calm atmosphere. During the daytime it feels hot and is minimal tree shades. It would be better to visit in the morning or evening when the air is cooler.